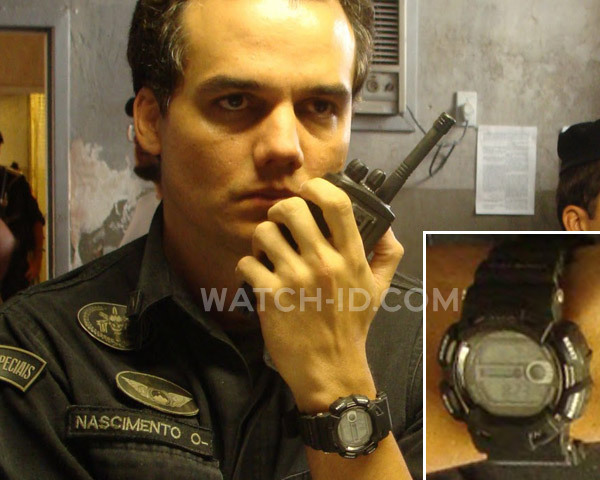 Wagner Moura wearing a Casio G-Shock Gulfman G9100-1 in the movie Elite Squad 2. In the movie Elite Squad 2 The Enemy Within (Portuguese: Tropa de Elite 2), actor Wagner Moura wears a Casio G-Shock Gulfman G-9100-1 watch. This strong G-Shock watch features a Shock resistant structure, 20 atmosphere waterproof functions, world time, moon phase (shape indication of lunar phase month), tide indicator, chronograph, timer and EL back light (dual illuminator, automatic light/write, afterglow). The watch can be clearly spotted on the movie poster as well. 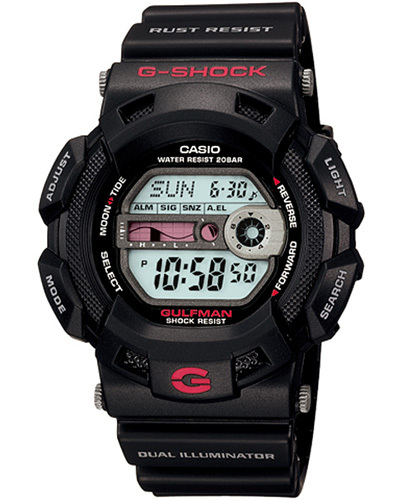 Get the Casio Gulfman G-9100 on Amazon.com ($93), Amazon.co.uk (from £52.29) or find a wide selection of new and used ones on eBay. More Casio watches can be spotted in the film, worn by other members of the Elite Squad.